I started making my own bread in November and I haven't turned back since for 3 reasons. 1- It is super delicious. 2- It is super easy. 3- My final cost per loaf is 53 cents. Yup that's right. 53 cents a loaf for homemade bread. I buy flour by the 25 lb bag, which breaks down to 13 cents a cup. Yeast is $4.29/lb in the bulk section of City Market. At 27 cents an ounce I only use .6oz for each 2 loaf batch. 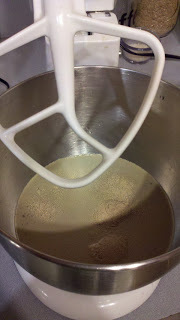 I added in an extra 5 cents for the 1 1/2 tbs of salt making each batch of dough $1.06. Each batch makes 2 loaves, so 53 cents a loaf. And it makes me feel good to know that there are 4 ingredients in my bread and I can pronounce all of them. This recipe is based off of the Master Recipe from a fantastic cookbook, Artisan Bread in Five Minutes a Day by Jeff Hertzberg and Zoe Francois. Put it on your must buy list, it is worth every penny. After taking it out of our library 3 times Greg bought it for me for Christmas and I adore it. They also have a great website you can check out. My version below is definitely paraphrased but stays true to their philosophy of easy low effort bread making. 1. Take out your mixer. 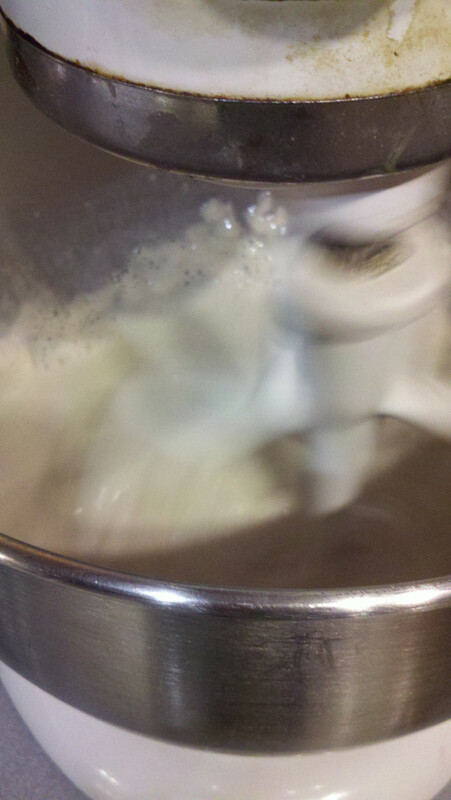 You can do it by hand but the mixer is loads easier. Yes, I am aware I have my paddle attachment on. 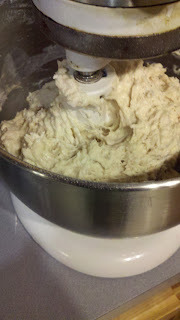 I realized halfway through that I have pregnancy brain and intended to put on the dough hook. You want to put 3 cups of warm water in the mixer. 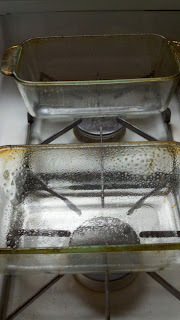 I use 1 1/2 cups cold tap water and 1 1/2 cups hot water from our electric kettle to achieve "warm". 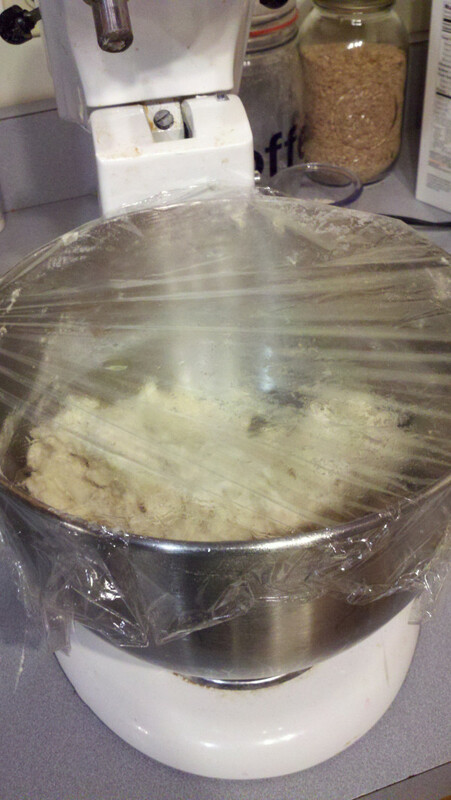 Add 1 1/2 TBS yeast and 1 1/2 TBS salt to the water. 2. After giving it a quick mix you can start adding your flour. You will put in a total of 6 1/2 cups. You want to do this in 1 cup measurements so that the flour doesn't compress and you get accurate measurements. I add in 2 1 cup measures at a time then mix. As you get towards the last few cups of flour the dough will become much stiffer so make sure you lock your mixer head so that it doesn't bounce around. 4. Cover the dough with plastic wrap. I like to spray the side facing the dough with a little cooking spray so the dough doesn't stick to the plastic. 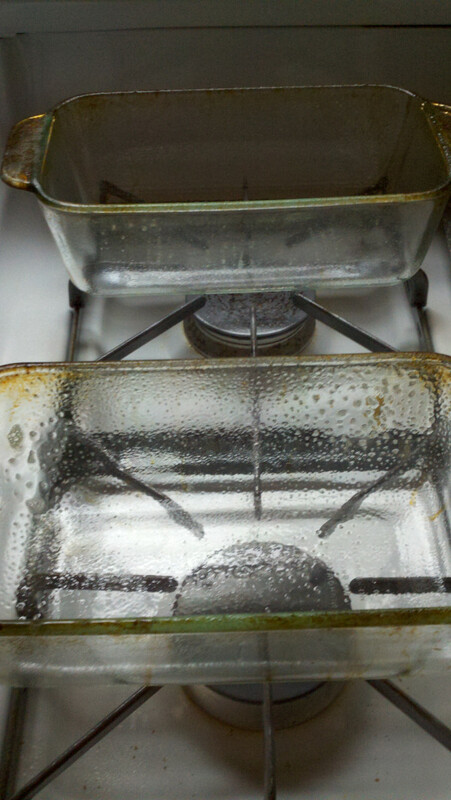 Let sit for roughly 2 hours on counter or until it rises to the top of the bowl. If you desire, you can leave the dough out for a little longer. 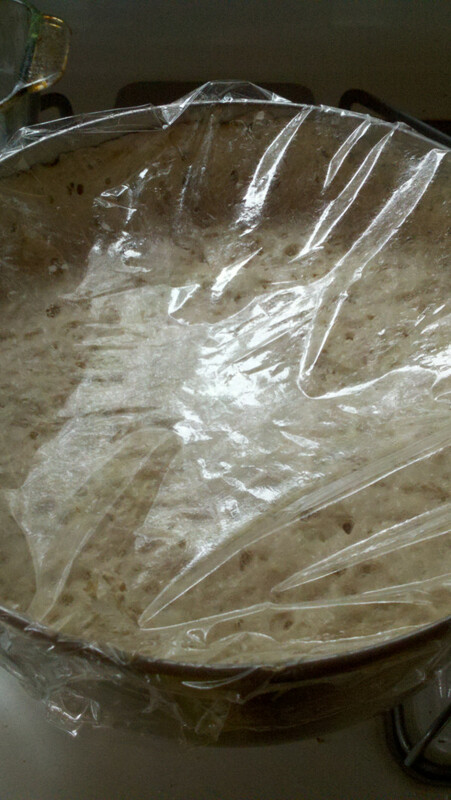 The longer it sits the more of a sourdough taste it has. 6. When you are ready to cook the bread, set the oven to 450. Spray 2 loaf pans with cooking spray to prepare them. 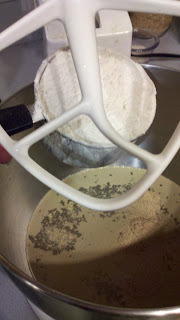 Then use a spatula to pour the dough into the two pans, splitting it as evenly as possible. 7. Cook the bread for 25-30 minutes at 450. 8. Admire your awesome bread. I like to slice it while it is still warm if I plan on freezing it. There are a million variations you can do. I sometimes add rosemary, thyme and oregano to the bread which pairs nicely with soups. I like to eat hot slices while warm with butter on top. Enjoy! 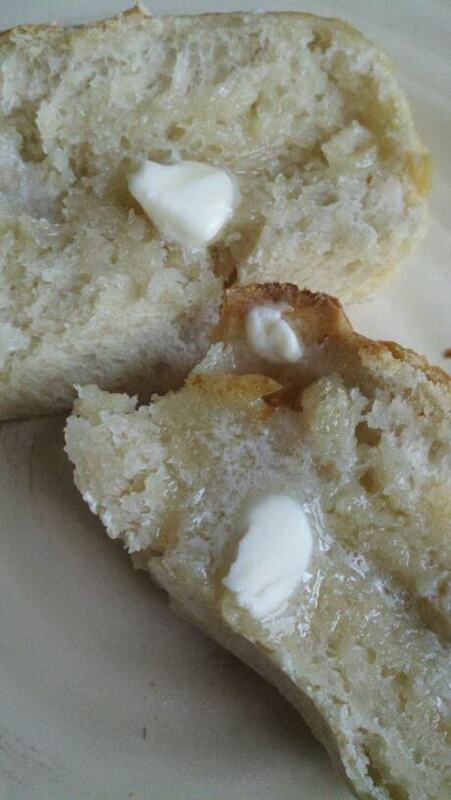 Bread right out of the oven smothered in butter is one of my favorite things! 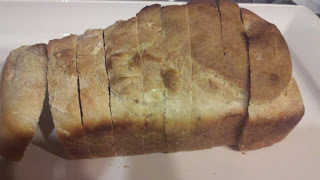 I just started (last week) making my own bread as we are trying to save money... I love this and will have to try your recipe vs mine to see which I prefer. My first batch didn't come out so hot but the one I made this weekend? Oh my delish! Thanks for this recipe, I will definitely try it. Great simple recipe. This is the most success I've ever had making bread. Thanks, Naz!